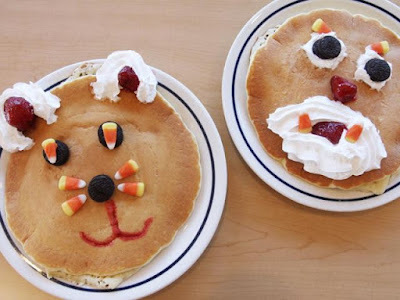 A creative tradition that allows kids to play with their artistic talents, IHOP has once again brought back Scary Face Pancakes for a limited time this month through Halloween. The dish features a buttermilk pancake topped with whipped cream and a strawberry nose. On the side, there's Oreo cookies and candy corn that can be used to decorate the pancake. Scary Face Pancakes are part of the available selection for IHOP's current Kids Eat Free deal, where kids 12 and under get to eat for free with the purchase of an adult entree from 4 to 10 PM at participating locations. Kids 12 and under can also get the pancakes for free on Halloween, October 31, 2016, from 7 AM to 10 PM at participating IHOP restaurants.